Pull out banner pen | BayFan :: Your Promotional Partner! BayFan :: Your Promotional Partner! Flag Pen,Custom Flag pen,Marketing Pull out banner pen,Pull out banner pen for company gifts. Customized Pull out banner pen with roll out flags. Pull Out Banner Message Pens. Free shipping to USA, West Euro, Australia. HSBANNER-9 is one of the best selling Pull out banner pen and with unique water drip clip and soft rubber grip. The Pull out banner pen with roll out flags HSBANNER-9 include a retractable paper flag with film coated to ensure durability. Your full colored advertisement picture can be printed on both sides of retractable flag size up to 180*68MM, which will impress all your target customers with your products or service. Pull out banner pen are a great way to create a lasting impression. With an eye-catching retractable banner housed inside a stylish pen, your message is sure to be kept handy and visible at all times. create excellent advertisement for any promotion idea. Need to convey a big message on your promotional item? This spring-loaded ballpoint pen includes a fully retractable poster that's perfect for your marketing information. Your creative, full-color promotion is printed on the poster. 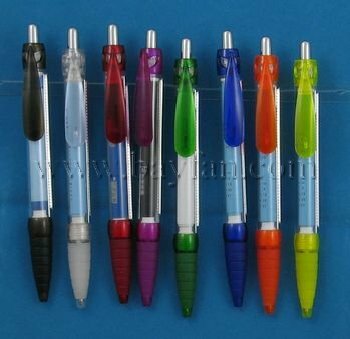 We've been professional Chinese manufacturer and direct seller of Pull out banner pens for years. 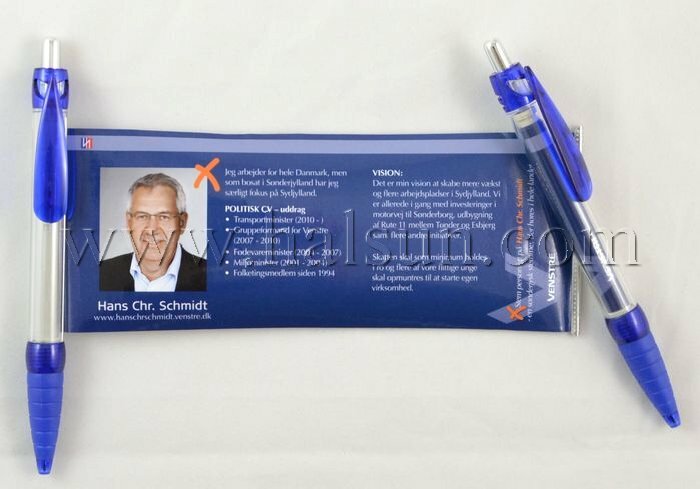 We've helped many companies to enhance their promotional program, distinguishing political candidates by giving away this unique and useful Pull out banner pens to public. Supplement your banner stand displays with the perfect trade show promotional giveaway. Message pens! Display your message inside a Pull out banner pen!
? Durability - built to last! Why Pull out banner pen? Scroll Banner Pens / Pull out banner pen are a novel idea that will make your next promotion unique, effective & fun. The simple scrolling design of the banner pen has an instant attraction to all who comes in conact with them. Add your choice of plastic pen colours and you've got a perfect match to your corprate look & style. Scroll Banner Pens are also known as info pens, banner pens, scroll pens, Pull out banner pen, billboard pens, and are most often refered to as pull out pens. Sample policy for flag pens. How to upload files to FTP server? Copyright © 2019, BayFan :: Your Promotional Partner!.